Cultural Survival and its affiliates stand at the forefront of a worldwide effort to create internationally-recognized Zones of Peace encompassing sacred shrines and/or environmental sanctuaries selected by each country on its own behalf. The detailed proposal was prepared and submitted to the UNESCO Seminar on the contribution of religions to the Culture of Peace held in Barcelona in April 1993 and has been forwarded to the Secretary General of UNESCO for recommendations. 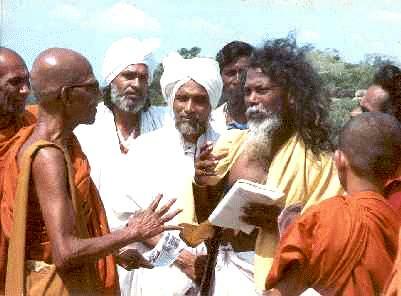 The full report highlights efforts undertaken in Sri Lanka by Cultural Survival over the years, including a 1989 proposal to declare Kataragama as a Zone of Peace and a subsequent proposal submitted to the 1991 SAARC Summit Conference for the creation of sacred environmental sanctuaries throughout the South Asia region. CST and the Living Heritage Trust continue to champion the concept of Zones of Peace in Sri Lanka. "Peace Begins at Home: Creating Zones of Peace within homes, schools and ourselves" article by CST volunteer Patrick Harrigan published in In Context journal.